We all like to make sure that our four-legged friends are in perfect health, we feed, walk and groom them but something that often gets forgotten about are the teeth. Unlike people, dogs are incapable of brushing and taking care of their own teeth, so as owners it’s our responsibility. Just like people, dogs need their teeth to be checked over regularly as they can be prone to plaque build up, gum disease, inflammation & tooth decay. Keeping on top Dog Dental Care is just as important as our own, dogs use their mouth for everything, so having healthy teeth and gums is absolutely essential. Its not just about the teeth either, oral bacteria can enter your dog’s bloodstream, causing problems to other organs like the heart, liver, kidneys and lungs. Dog Breath: Give them the sniff test (Okay, I know that dogs breath is never going to smell of fresh air and roses) However, if their breath is especially offensive then it’s a good idea to take your pooch along to a vet. Gums: Lift the dog’s lips and examine their gums. They should be healthy and pink. The teeth should be clean without any brownish tartar. 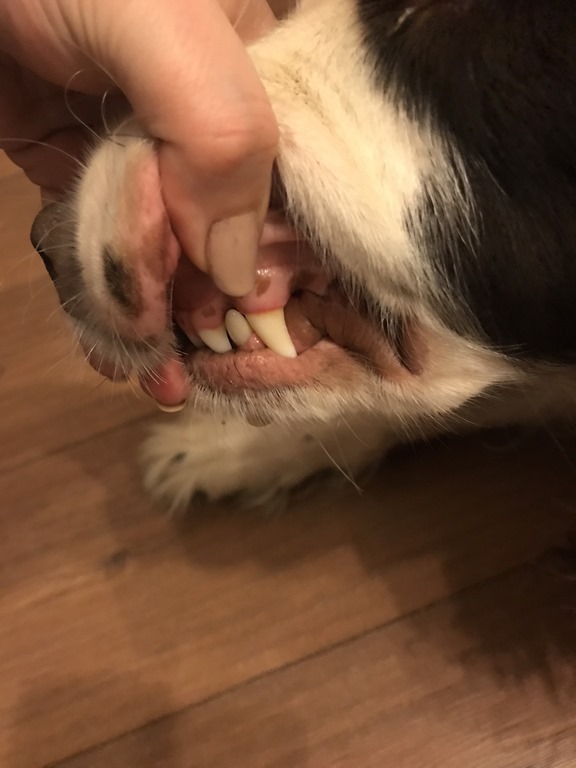 Loose teeth and broken/damaged teeth. Dogs can lose and break teeth with age but it’s always best to have them checked out for signs of gum disease and any obvious pain. 1) Check their mouths regularly, dogs can become comfortable with you looking inside of their mouths, but make things easier for yourself by working with your dog as a puppy. We have one cooperative dog (Obi) and one not so cooperative (Loki) who runs for the hills when it comes to giving them the once over. You are checking for any signs of odours, soreness, lumps, inflammation, obvious damage to the teeth or mouth etc. 2) Provide clean and fresh water daily, also clean out the water bowl daily, it can become a breeding ground to a host of nasty bacteria. 3) A good diet – dry food tends to be a lot better for the teeth than wet food which can cause tooth decay. We feed a mixture of dry kibble and raw which also helps with dog breath. 4) Use a tooth brush but don’t use regular human toothpaste which can be toxic to dogs, especially if it contains fluoride. You can find specially formulated toothpaste for your canine pals at most pet stores, supermarkets and even online.. Regular cleaning can prevent build of of plaque and tartar as well as reducing the risk of gum disease. Again it’s best to start doing this whilst your dog is still a pup to get them used to it, we’ve discovered that dogs have little patience when it comes to teeth brushing. Our youngest, Loki will not tolerate teeth brushing at all and suddenly becomes the master of escaping and hiding when he see’s his toothbrush. 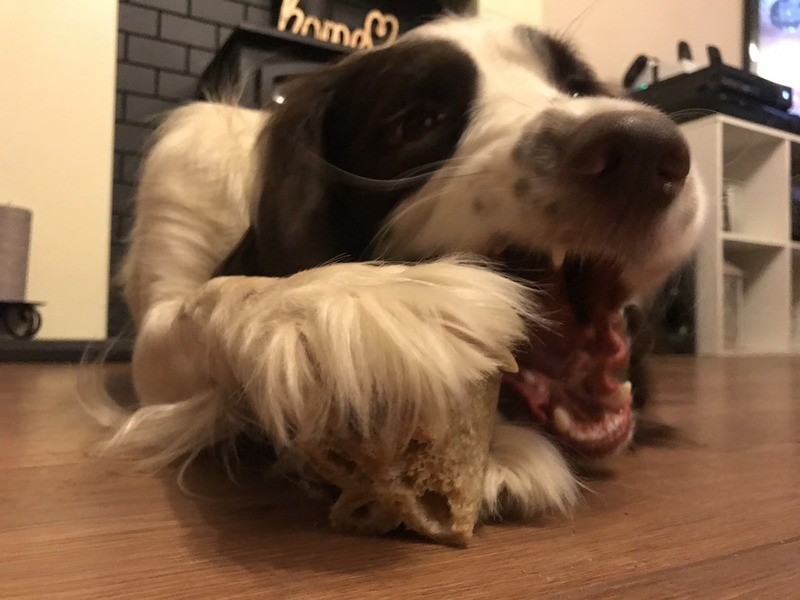 5) Dental chews, special chews and toys – we use a combination of toys and dental chews like Pedigree Deep Clean DentaFlex which both dogs look forward to and enjoy. 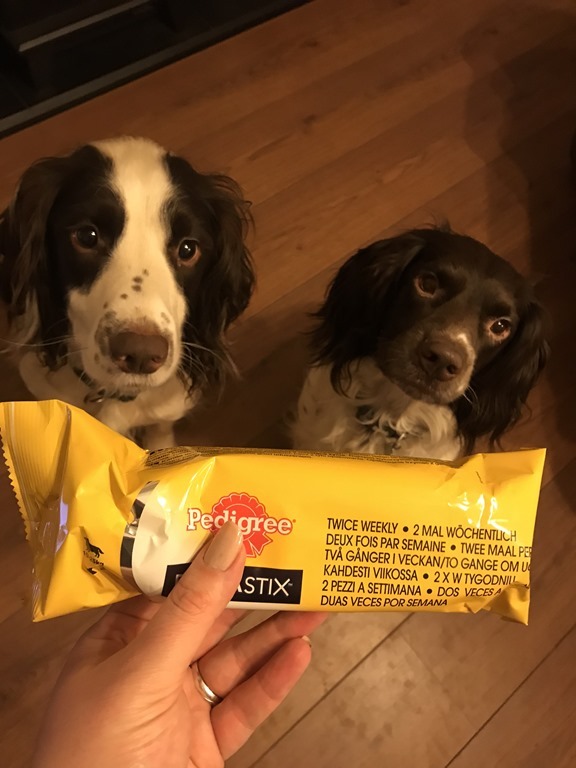 Especially the dental chews, to them they see them as a treat (if only they knew they were good for them!). They work by deep cleaning the plaque around the gum line, where it matters the most. This post is a collaboration with Pedigree, but all thoughts are my own.